Merrilily Gardens, in Woodstock, is a live-plant nursery specializing in hybrid daylilies and perennials. They sell 250 different varieties to customers as far away as California, but most of their customers come to the garden and dig them up to take home. June is the best time to visit to see most of the varieties in full bloom. Merrilily also has a line of gourmet salsa, sauces, and jams that are available at retail locations across Georgia. 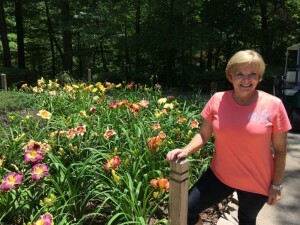 Merrily McLaughlin in front of some of her beautiful daylillies in full bloom. We moved to Cherokee County in 1999 from south of Columbus. Favorite Tool: Spading Fork, shovels damage the roots of the daylilies so a fork allows you to dig it up without hurting the roots. I was an organic chemistry major in college and managed hospital labs for twenty years. When going home from work after a stressful day, I used gardening to relax . Growing vegetables and flowers became my passion. My grandmother always grew irises and daylilies because they were beautiful and came back every year, so I built my gardens using that memory of her. 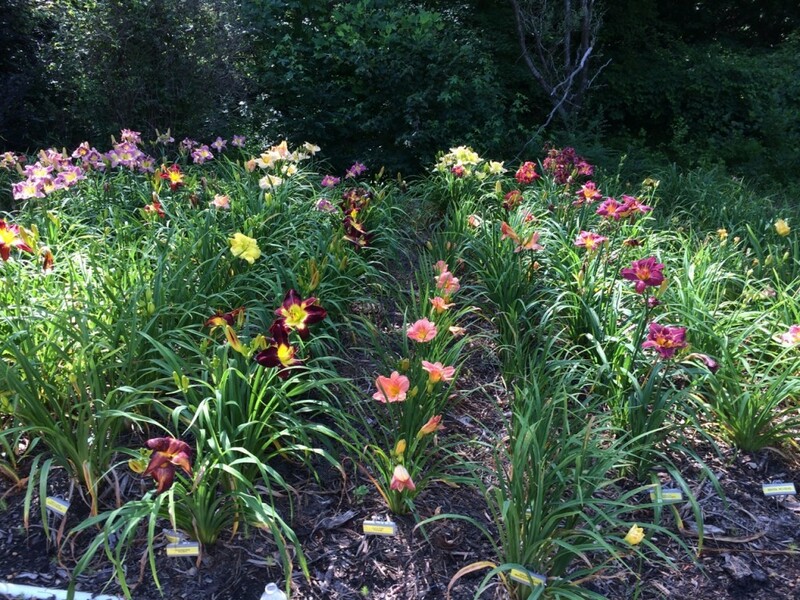 After moving to the Columbus area where it is even hotter and dryer than Atlanta , Daylilies were one of the plants that would grow in that climate. So I started collecting them from that area. Once I moved back to Atlanta , I brought 50 varieties with me and started collecting again. The gourmet food came as a result of growing so many vegetables I had to learn to can and freeze so there was a minimum of loss of the veggies. Keeping all the plants watered, especially in the summer when their blooming. Getting up every day and seeing the flowers do what they are supposed to do. Posted in Cherokee County, day lillies, Flowers, growers, live plant nursery, local business, Master Gardeners, nursery. This entry was tagged Cherokee County, daylillies, local growers, master gardener, nursery, perennials. Bookmark the permalink.